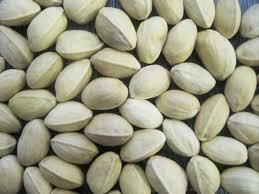 As with other tree seeds, aflatoxin is a toxin found in poorly harvested or processed pistachios. Aflatoxins are potent carcinogenic chemicals produced by molds such as Aspergillus flavus and Aspergillus parasiticus. The mold contamination may occur from soil, poor storage, and spread by pests. High levels of mold growth typically appear as gray to black filament-like growth. It is unsafe to eat mold-infected and aflatoxin-contaminated pistachios. Aflatoxin contamination is a frequent risk, particularly in warmer and humid environments. Food contaminated with aflatoxins has been found as the cause of frequent outbreaks of acute illnesses in parts of the world. In some cases, such as Kenya, this has led to several deaths. 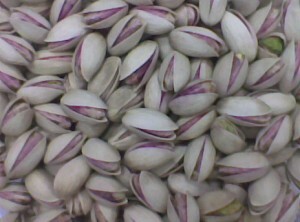 Pistachio shells typically split naturally prior to harvest, with a hull covering the intact seeds. The hull protects the kernel from invasion by molds and insects. But this hull protection can be damaged in the orchard by poor orchard management practices, by birds, or after harvest, which makes it much easier for pistachios to be exposed to contamination. 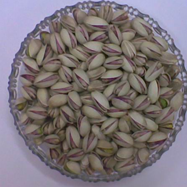 Some pistachios undergo so-called “early split,” wherein both the hull and the shell split. Damage or early splits can lead to aflatoxin contamination. In some cases, a harvest may be treated to keep contamination below strict food safety thresholds; in other cases, an entire batch of pistachios must be destroyed because of aflatoxin contamination.